New Britain Museum of American Art, Connecticut. John Butler Talcott Fund. 1912.2. Hollis Taggart Galleries, New York, is pleased to announce, “From Hawthorne to Hofmann: Provincetown Vignettes, 1899–1945.” This landmark exhibition, curated by Vivian Bullaudy, Director of Hollis Taggart Galleries, explores the significance of Provincetown as a locus of artistic activity in the history of American art. Sixty works will be featured to illustrate key moments in Provincetown’s history and demonstrate how Provincetown became a wellspring for future directions in American painting. Among the artists whose work will be on view are Charles Hawthorne, Edwin Dickinson, Charles Demuth, Stuart Davis, Marsden Hartley, William and Marguerite Zorach, Arthur B. Carles, Mercedes Matter, and Hans Hofmann. This exhibition will be accompanied by a fully-illustrated color catalogue that will examine galvanizing moments and key personages in Provincetown’s history through an anthology of essays by leading scholars. The texts presented by Professor Richard J. Boyle, Dr. Michael Taylor, Tina Dickey, Dr. Barbara Wolanin, and Avis Berman will complement the rich array of artwork on view. The catalogue’s opening essay by Professor Richard J. Boyle, Adjunct Associate Professor of Art History at Temple University and former Director of the Pennsylvania Academy of the Fine Arts, will discuss Charles Hawthorne’s role in establishing Provincetown as a celebrated enclave for American artists. Professor Boyle will examine Hawthorne’s role in the founding of the Cape Cod School of Art and his involvement in the Provincetown Art Association. He will present a portrait of Hawthorne as both artist and teacher and discuss the profound impact on his students in Provincetown, including the visionary artist Edwin Dickinson. Hawthorne’s considerable talent will be highlighted in the exhibition through monumental works such as The Fisher Boy and through more intimate vignettes such as Orange and Red. His impact on Dickinson will be highlighted by atmospheric signature paintings such as Dickinson’s O’Neil’s Wharf and 46 Pearl Street. Dr. Michael Taylor, Acting Chief Curator of Modern and Contemporary Art at the Philadelphia Museum of Art, will reevaluate Marsden Hartley’s development as a modernist through a considered examination of the artist’s Movement series, which stemmed from his summer stay in Provincetown in 1916. Dr. Taylor will illuminate how this summer represented a critical juncture in Hartley’s career as he embraced a reductive language of abstraction far more radical than in his previous work. This new direction by Hartley will be beautifully illustrated by the selected paintings featured in the exhibition, a key example of which is Sail Movement. 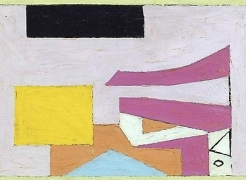 Hartley’s works will be shown in conjunction with select examples of his contemporaries in Provincetown such as Marguerite Zorach’s Provincetown and Stuart Davis’ Ebb Tide, Provincetown. 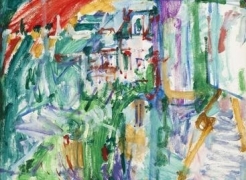 “Provincetown Vignettes” will also highlight imagery by Arthur B. Carles, Mercedes Matter (Carles’ daughter) and Hans Hofmann. These three influential artists spent a momentous summer together in Gloucester in 1934. Dr. Barbara Wolanin, Curator for the Architect of the Capitol and leading expert on Arthur B. Carles, will demonstrate through her catalogue essay how this Gloucester summer served as a prelude to Hofmann’s establishing his Provincetown school in 1935-, was a time of inspiration in Carles’ life and career, and was an influential moment for Matter’s artistic direction. This important confluence will, for the first time, be visually documented through such works as Matter’s Untitled Abstract and Carles’ Composition. Another significant contribution to this catalogue is offered by the independent art historian Avis Berman who presents a previously unpublished reminiscence by Katharine Kuh. Kuh, who was a pioneering curator, critic, and writer, recorded her experiences in a text that characterizes Hofmann as a teacher and intellectual force. This insightful vignette is accompanied by an introduction by Berman that contextualizes Kuh’s significant support of the emerging American avant-garde. Hans Hofmann’s significant contributions will be further illuminated in this exhibition through an insightful account by Hofmann scholar Tina Dickey that discusses his preeminent role as a progressive teacher and painter within the matrix of Provincetown. 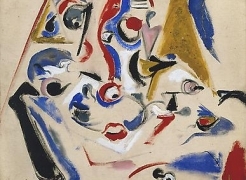 Examples of the many works by Hofmann in the exhibition include Untitled (Gulls with Sailboats) and the iconic Seated Woman IV. By bringing together the work of these diverse artists, “From Hawthorne to Hofmann: Provincetown Vignettes, 1899–1945 ” illuminates Provincetown’s legacy as fertile ground for pioneering developments in American art.